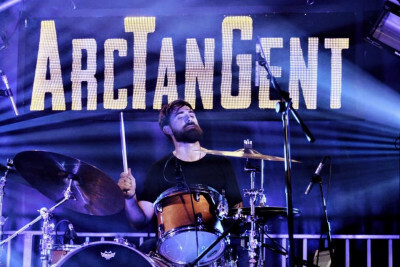 Tuned In Travel - ArcTanGent Festival 2018 Review - Intimate and rocking! 5000 people boarded trains and coaches to see the best of Math, Post, Noise and Alt Rock, performed across four epic stages. Hosted on Fernhill Farm, the festival is a little out of the way for those who don’t drive. Luckily Tuned in Travel provided shuttle buses from Bristol Temple Meads and the airport straight to the festival, as well as many return coaches across the country, making it super easy to get there. Upon arrival you immediately noticed how the strict, small capacity gave the festival a cosy feel, with friendly faces everywhere. While there wasn’t the traditional glitter covered crowd you come to expect at festivals, there were true music fans, plush with band knowledge and all with a recommendation of who not to miss. For an ArcTanGent newbie this was really helpful! The music was incredible, with bands and artists putting their heart and soul into the performances. From the moment the music started, people were at the stages truly making the most of each act. Thanks to the intimate, smaller site, it took only a matter of minutes to move from one stage to the next meaning the crowd could get to the next act without delay! Thursday was an epic opening to the festival and Jamie Lenman was just one of the many outstanding acts to play the Arc Stage. Showcasing a mix of old and new music, he had the crowd going wild with his sharp wit and fierce lyrics. For me, the highlight of the festival was watching And So I Watch You From Afar who concluded the opening night. Their energy was electric, with each musician taking ownership of the stage and connecting with the crowd. This instrumental band have blessed the ArcTanGent stage before and their confidence at the festival really showed. It was a perfect way to launch into the weekend. The following days were no less spectacular with God Mother crashing onto the stage on Friday with endless energy. Lead singer Sebastian Campbell held nothing back in his performance, getting into the crowd and really using the space to ensure everyone was engaged. On Saturday La Jungle set the day off in all the right ways with their upbeat sounds that the crowd were more than happy to dance away to. All of the bands made a great impression and had a special something that set them apart from the others. The vast selection of music available meant it was likely you’d be able catch a band you hadn’t heard of before. Once the live performances stopped the silent disco came alive with masses of people turning up each night to enjoy. A sea of people wearing headphones and dancing the night away was a genuine pleasure to witness and partake in. You could rent the headphones for the entire weekend which was brilliantly convenient, you just had to be sure not to lose them! Although there were no showers provided to general camping, the facilities were overall very good, with an abundance of friendly staff who were happy to help in any way they could. Running water taps were provided to keep you hydrated and allow for a little more than a wet-wipe clean! Plenty of portaloos were also on site which were cleaned regularity and (almost) always has loo roll. As well as this, a wellness tent was pitched and ready to welcome those who may have partied a little too hard. Best of all, there were plenty of little stalls selling everything from camping chairs to portable chargers. The food selection was divine with something to suit everyone’s pallet. For me, the best was the freshly made onion bhajis; exceptionally tasty and satisfying. Another favourite food stop was in the shisha tent where you could grab a hot mug of chai and a delicious breakfast wrap to start the day right. This bohemian pit-stop was a great place to lounge around mini tables upon a mass of comfy pillows and watch the world of ArcTanGent go by. I was also very grateful to be able to grab a cup of good coffee dancing the nights away. Overall, ArcTangent took me by surprise, taking everything I thought I knew about what was needed to make a festival epic and turning it on its head. It had me falling in love with the intimacy of a small crowd, meeting passionate fans who didn’t mind the music stopping and starting earlier than larger festivals, and best of all listening to bands whose names I’d never heard of before but now can’t get enough of. ArcTanGent again may only just be over but I’m already excited for 2019 to come around and to throw myself into the weird and wonderful world of ArcTanGent.